Get the power from 200 years old tea farm. About 185 years ago, in Edo era, Japan was still in national isolation. In the world, the time when Napoleon was drinking a dark black tea. 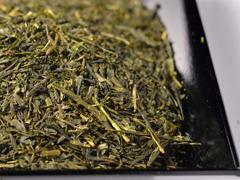 This Sencha is only made from the tea leaves which is picked from trees from Edo era in Tahara area. Usually tea trees which is cultivated by agricultural practice, using agricultural chemicals and chemical fertilizer run 20 ~ 30 years or so. In Takenishi farm, the tea trees flourish more than 185 years. The shop board and tools for making medicine, which Mr. Takenishi’s ancestors had carried on pharmacy in Edo era, are conserved in his house. Medicine at the time are medical plants, the famous one is tea. This tea tree must be planted as a medicine also. Japan, opened to the world, with many difficulties occurs, but strong old trees bear young shoots every year. Others does not reside this vitality.